So, as an artist, I have been inspired by many other artist. Many being “fishing” artist and many being other masters of other subject matter. 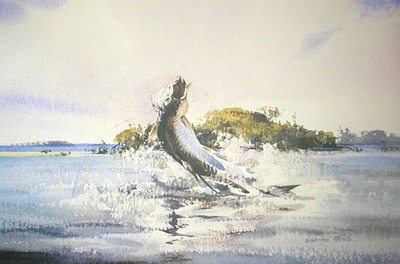 I can definitely remember the time period of which I knew I wanted to paint and draw, and I knew I loved fishing. 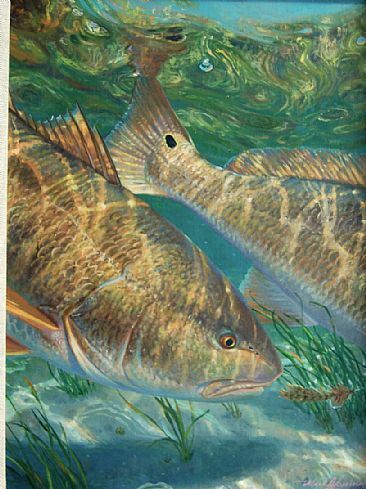 It was around the year 1992 or so when I walked into Collector’s Covey in Dallas, TX and saw a print of a Brown Trout underwater by the artist Mark Susinno called “On Target.” Something about this painting made me realize what I wanted to do, what I wanted to be. To this day, I don’t really like to paint the details exactly like Mark does, but there is something from his paintings in everything I do, to me he is THE BEST. To this day, I still haven’t met him, but we have exchanged plenty of emails about different things from why he paints on linen, or how to get good research photography and so on, basically I ask him a question and he as always spends time out of his day to answer to the best of his ability. Sometimes our heroes actually turn out to be heroes, he is one of mine…Mark, thanks again for the business card drawing! Another one of my heroes is Eldridge Hardie. I was lucky enough to say I was in the same show as he last year in Charleston, SC at the Southeastern Wildlife Exposition. To have Eldridge Hardie come to my booth and look at my artwork was one of the most incredible moments of my art career. I have considered his work to be such legendary status in the Sporting Art world and feel very fortunate to have met him last year. Eldridge, if you are reading this, I still want to come fish with you this summer…lets make it happen! Paul, Those are mighty nice words. It was a pleasure meeting you in Charleston. I look forward to getting together with you.